Everyone seems to say that Christmas is about love. It’s in the songs we hear as we shop for presents and in the adverts we see on TV. It’s in the cards we send and on the gift tags we write. And Christians can agree. Christmas really is about love, because love came down at Christmas in the person of Jesus Christ. This Advent devotional contains 24 daily readings from 1 Corinthians 13. Sinclair B Ferguson brings the rich theology of the incarnation to life with his trademark warmth and clarity. We'll see what “love” looked like in the life of Christ and be challenged to love like him. Each day's reading finishes with a question for reflection and a prayer. However you're feeling, your heart will be refreshed as you wonder again at the truth that love came down at Christmas. 13. Rejoicing: Right or Wrong? 15. Believing Everything and Anything? These devotional meditations are deeply soaked in Scripture, rich, vivid, always nourishing, sometimes challenging, often thrilling. I thank God for them. 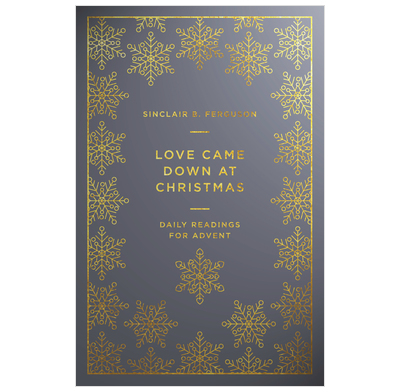 With Love Came Down at Christmas, Sinclair Ferguson has written yet another book to bless and build up God's people. So read it! Only the gospel of Jesus pierces our faulty understanding of love with the real, convicting and winsome love of God. This devotional will warm your affections for Christ and remind you of your identity in him as a lover of God and a lover of others. Gently convicting and richly God-glorifying, this Christmas devotional is a gospel-saturated delight! Read it and celebrate the living and liberating love of God for his world. Amidst all the glitter, goo and glow of Christmas, let “Love Came Down at Christmas” warm your heart with the wonder of God’s saving purposes. Sinclair Ferguson’s insightful simplicity will refresh you in the ancient Christmas story, and help you stoke the fire of devotion for God, which should characterise all our Christmas celebrations. A helpful, reflective Jesus centred book, just right for quiet times during the busy lead up to Christmas. Love Came Down At Christmas by Sinclair Ferguson brings the message of Christ’s love to you in a unique and special way. Rather than simply focusing on traditional Christmas themes or sections of scripture, Ferguson chose to walk readers through 1 Corinthians 13—the Bible’s famous love chapter. He reminds us that the words of 1 Corinthians 13 can profoundly move us during the Advent season. We are shown that “when you slow them down, and read them phrase by phrase, and apply them to yourself, they transpose into a different key altogether. They cease to be rhetorically pleasing and emotionally soothing; instead they become an analysis of your spiritual life. They are deeply challenging” (p. 11). Each day, you get a little bit of exposition, Ferguson’s warm personality and affectionate teaching style, and Christ-focused application. You also get some helpful reflection questions and poetic prayers from various saints throughout church history. The concise, truth-packed chapters are a wonderful way to start each day leading up to Christmas. I bought copies of this book as Advent gifts for my bible study group. I can't wait each morning to read the day's pages! Seriously, this is the best and most comprehensive Advent book I have used and it goes way beyond Advent. It is a very readable and inspiring treatise on love. Thank you Sinclair for this gift to us all. Everyone should have a copy! I am blown away by this book. I am reading it each day via the PrayerMate app but like it so much I am now coming online to order a paper copy. A wonderful (and challenging and deep) meditation. Could be read any time of year - not just Christmas. Superb. I came to this book knowing that Sinclair Fergusen is a great thinker, a writer with a deep love of God, His word and His people. But taking the oft-used 1Cor 13 and rescuing it from Weddings, to use coming up to Christmas is a novel and great place to start. But the exposition, reflections and more importantly the beautiful and timeless prayers often featured at the end of each short (but absolutely densely packed) reflections on the verses or sometimes parts of a verse are wonderful. I have enjoyed many a good book, but this feels like several books worth in small easily digestible sizes. Thank God for the wonderful gifts He gives to men, who can take the scripture and give us new insight and understanding without going over our heads, or missing our hearts. Highly recommended. These delightful and deep meditations are insightful, full of Scripture, full of Christ, well illustrated with stories, deep - generally a must buy. Only 5 pages a day and not big pages, with stories; so thoroughly readable. Get one for everybody in your church. I was surprised to find that this book is a reflection on 1 Corinthians 13, but I now see how appropriate it is. I find that Christmas can be a time when we fail to love others as we should, or we lose sight of Christ's love for us amidst the chaos and busy-ness. In these daily chapters, Dr Ferguson explains each verse in its context and then points us to Christ, the only one who loves perfectly. It has inspired me to imitate Jesus, my true righteousness, this Christmas.